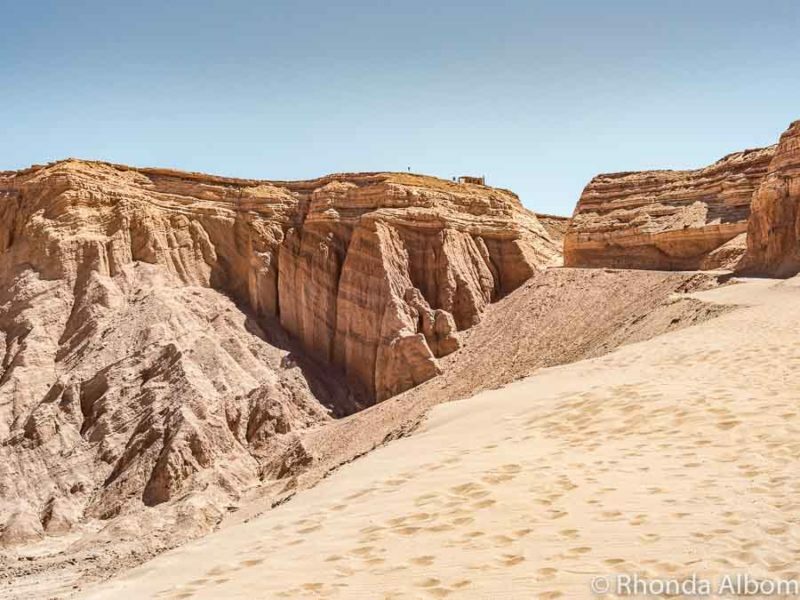 Mysterious and enchanting, the barrenness of Chile’s Atacama desert is captivating. The high elevation and ultra-dry climate creates endless unusual landscapes and salt flats, while its main town is a lush desert oasis. 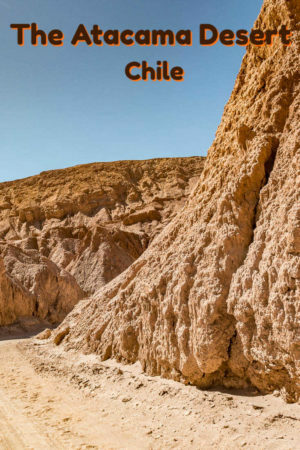 There seems no limit to the unique things to do in San Pedro de Atacama and its surrounding desert, the driest non-polar desert in the world. 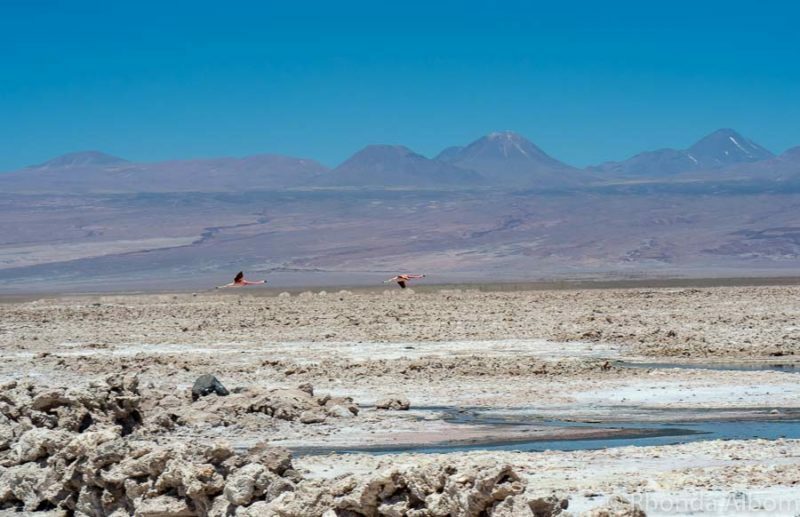 8 Which of the things to do in San Pedro de Atacama will make it onto your bucket list? 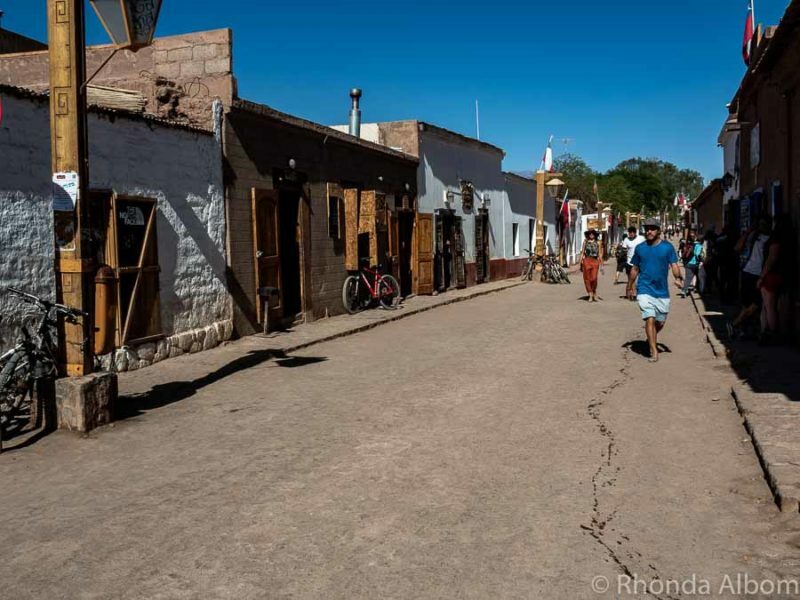 We spent six nights in the Atacama desert, and while San Pedro de Atacama is an interesting town, the real magic happens in the surrounding desert. Below are the highlights grouped in suggested daily itineraries. A small section of Rainbow Valley. Rainbow Valley is a striking example of colours in nature. The valley’s mineral and rock formations display in red, orange, yellow, green, and purple. This, along with the white salt and blue sky, makes a “rainbow” of colours that appear even more vibrant in person. PRO TIP: If you are driving, our advice is to ignore the washboard dirt road suggested by the Google maps GPS navigator. Instead, stay on the paved road towards Hierbas Buenas, and then continue on to Rainbow Valley. Petroglyphs of llamas at Hierbas Buenas. Hierbas Buenas (often spelt Yerba Buenas) is home to 11,000-year-old petroglyphs on various rock outcroppings. It has the largest concentration of rock art in the region. PRO TIP: Drive between the rock groupings, as the last one is quite a distance to walk on a hot day. Small cave dwellings can be seen in the lower cliff face at the archaeological site of Valle de Jeré. Valle de Jere is a centuries-old settlement with a manmade irrigation system fed by a river running through the gorge. There are gardens, a quarry, petroglyphs, and cave-type dwellings once inhabited by the Likan-Antay people. Blocks created from the quarry rock have been used in local building construction. PRO TIP: According to a local, it is okay to enter the cave dwellings. As Sarah quickly discovered, many have a small tunnel to crawl through before entering the large room. Flamingos flying over the salt flats at Laguna Chaxa. Laguna Chaxa is located in the Salar de Atacama (salt flats) and is the best place in the region to see flamingos. A park ranger guided us through the information centre behind the ticket booth before we headed down the boardwalk to the large salt lake where the flamingos seemed to concentrate. As the path loops through the salt flats you pass several interpretive panels. PRO TIP: It’s best to visit early, as the birds have often flown away for the day by 2 pm. If you prefer to take a tour, check out this option that includes Los Flamencos National Reserve and Socaire Village. We stopped here to see the Inca-style terraces. In this tiny village, we also found a charming church, saguaros (a type of cactus), a school, and several small shops and cafes. A panoramic view of Laguna Miscanti. This deep blue lake is located in the altiplano (high altitude tableland). It’s a mix of fresh and salt water that is renewed by the seepage of both rain and groundwater. It freezes in winter. There are often wild vicuña (a relative of the alpaca) at the water’s edge. As a result of the high altitude, I had a massive headache that went away once we descended. PRO TIP: Allow a bit of extra time to get here. The speed limit on the road to Laguna Miscanti is 20 km/hour. Looking out over the vastness of Valley de la Luna. Photo Credit: ©Sarah Albom. All rights reserved. Looking up at Pukará de Quitor. Pukará de Quitor is a pre-Columbian archaeological site. When we arrived, we were told it is an uphill climb to reach the site, it takes at least two hours to explore, and should not be done in the heat of the day. It was highly recommended that we return when it was cooler, but we ran out of time, and that never happened. Our only shot is from the ground, looking up at the site. Called either Valle de Marte (Mars Valley) or Valle de la Muerte (Death Valley), it’s an otherworldly area with two names. Vehicles can drive 4km into the park, but the final kilometre is walked as there is quite a bit of sand on the road beyond the parking area. For us, however, the highlight of this valley is the landscape during the first two kilometres of driving. PRO TIP: Sandboarders love this place, as there is a huge dune towards the beginning often used for the sport. Claiming the clearest skies in the world, the Atacama desert is well known by stargazers. We visited during the full moon, and therefore none of the stargazing tours took place. Before the bright moon rose, there were more stars than we see in most spots in the world. 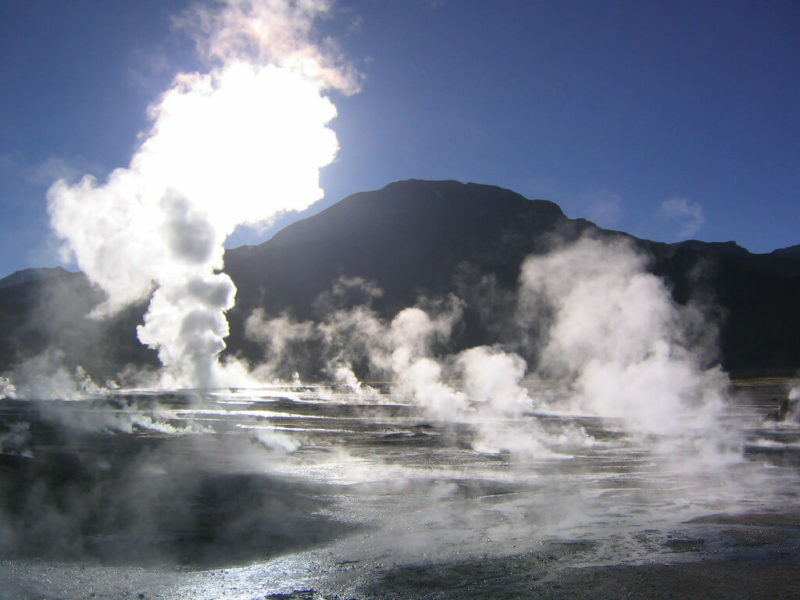 El Tatio is the third-largest geyser field in the world and the largest in the Southern Hemisphere. Having just been to Rotorua New Zealand recently, we opted not to visit the geysers, although seeing sunrise here is a popular road trip amongst tourists who are willing to get up early and start driving in the dark by 5 am. 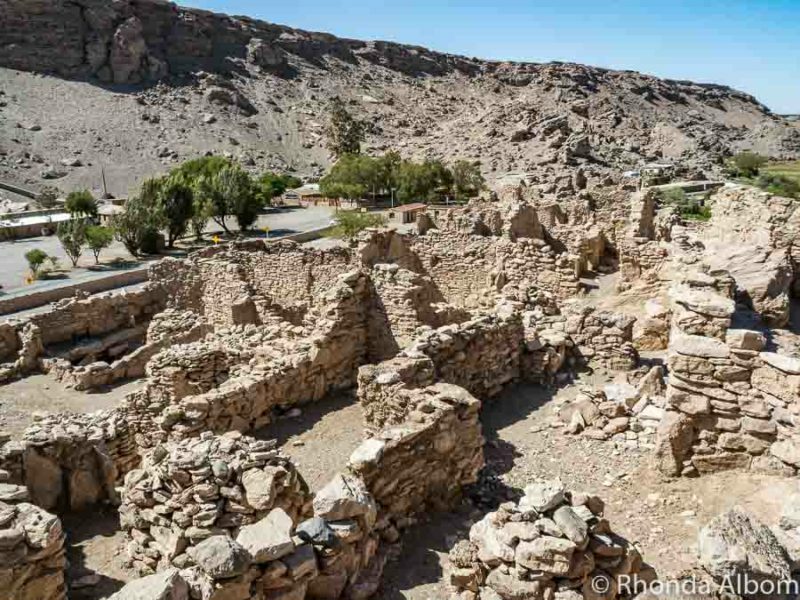 Tulor archaeological site – you can see the two full-scale house replicas in the background. Before heading out to the archeological site, a guide took us to the interpretive centre and offered us samples of some of the edible plants and seeds used by the people who once lived here. Here I tried chañar seeds, a flavour used in the local ice cream. At the site, we found a lifesize replica of one of the huts and the archaeological remains of what has been discovered. Some of the earliest houses to be uncovered have begun to collapse. As a result, much of the site is not unearthed, just uncovered. PRO TIP: There are two car parks; one at the entrance, the other at the site. 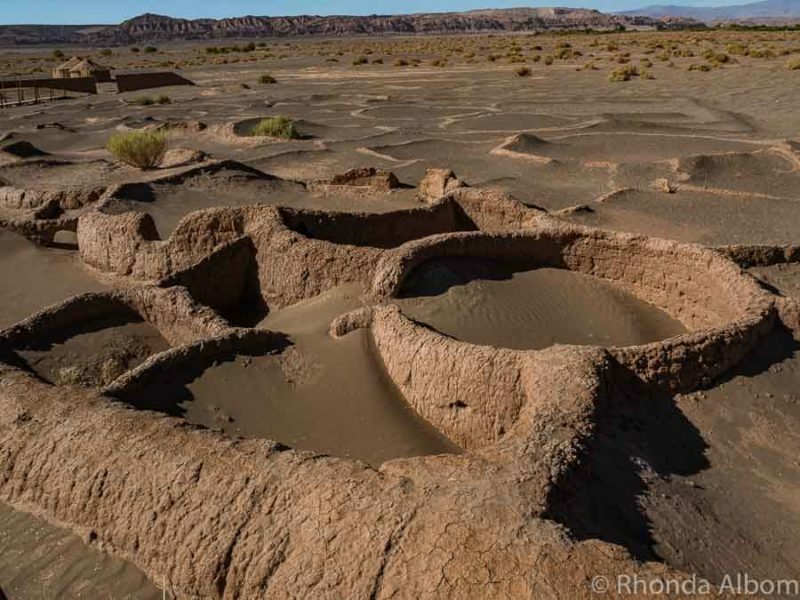 The ruins of this 12th-century fortress located to the east of Calama are a maze of rooms, homes, buildings, entranceways, and rubble. Well worth a visit, especially if you are spending a night in Calama. The road sign alerted us to look for the petroglyphs on the road leading from Pukara Lasana. All buildings in the historic district are adobe, and none can exceed 6 metres. (The modern section of town has concrete buildings). Interestingly, there is only one licensed bar in town, and it’s on Caracoles Street. Therefore, tourists need to order food in a restaurant if they are drinking. However, it’s rumoured that if locals just want to drink, the staff will place dirty dishes on their table. Caracoles Street in San Pedro de Atacama. Whether or not you choose to enter the church, be sure to notice the pattern on the fence. It features two common symbols in the region. The triangle symbolises the volcano, and the other shape represents the Andean (Inca) cross. The artisanal market, as well as the produce market (not shown here), are open daily. 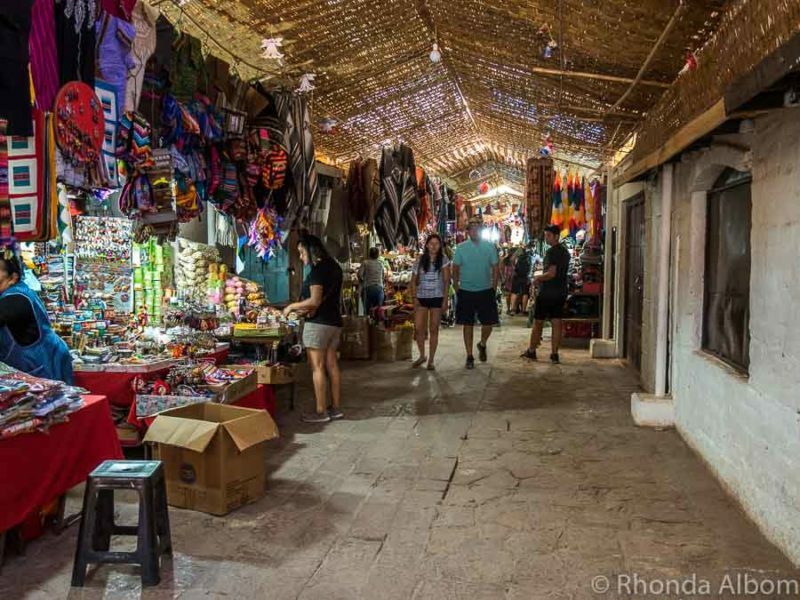 This is one of two markets we visited in the town of San Pedro de Atacama. The other was a farmer’s market. If you want to feel like a local, eat a meal el Huerta. After your meal, lie on one of the hammocks in the back and relax. Lured in off the street with a free drink, we ate dinner at Agua Loca. I enjoyed the live music and my perfectly prepared steak. There are several ice cream shops in town, pick one and try a flavour called Chañar. It’s made from a tree nut of the same name and has a similar flavour to manjar (Chile) or dulce de leche (Argentina). Regardless of where you eat, if you drink alcohol, try a Pisco Sour with Rico Rico. 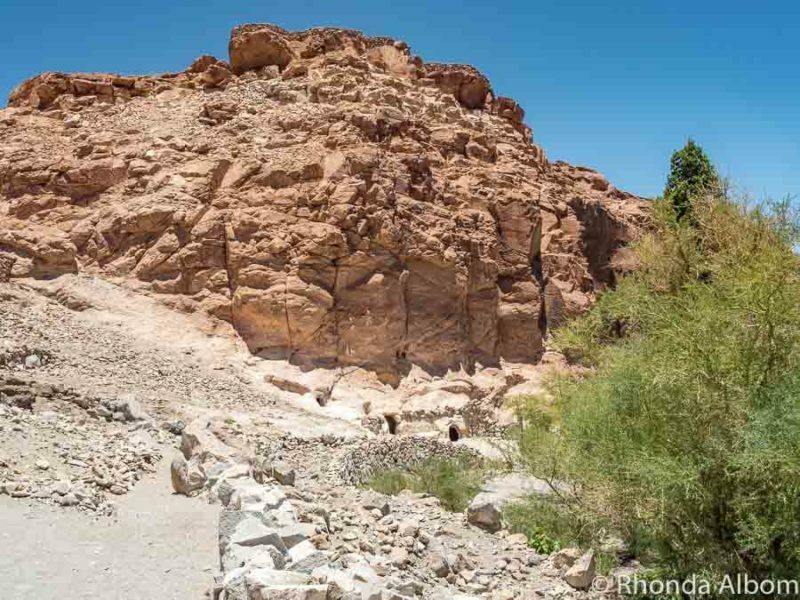 If you don’t have a car, or even if you do and the desert roads intimidate you a bit, the best way to enjoy some of the more difficult to get to sites is with a tour. We have used Get Your Guide successfully in other parts of the world, and always enjoy their range of options. If you are heading to high altitude, spend a few days acclimatizing first. A tea made from coca leaves is helpful both to prevent and reduce the symptoms of mild altitude sickness. It’s widely available in the region. Bring bottled water with you on any desert walk or long car drive. Don’t drink the local tap water as it has too many minerals. The summertime Atacama desert temperature is hot during the days, and cold in the mornings and at night. Bring a jacket if you are heading into the desert, even if you plan to be back early. Most of the parks have a nominal entry fee and will provide a park map. If you ask someone will highlight the key stops. Valle de la Luna, Valle del Marte, and several other parks offer an early entry discount for entry before noon. According to our city tour guide, desert parties often turn dangerous late a night. He recommends leaving when other people start to go. 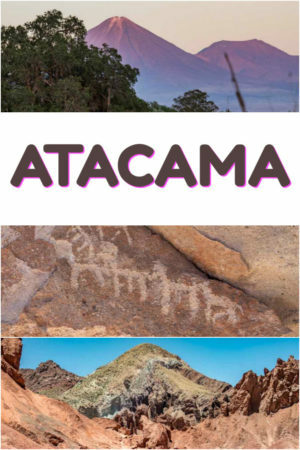 We flew from Santiago to Atacama and picked up a rental car in Calama (we recommend RentalCars.com). 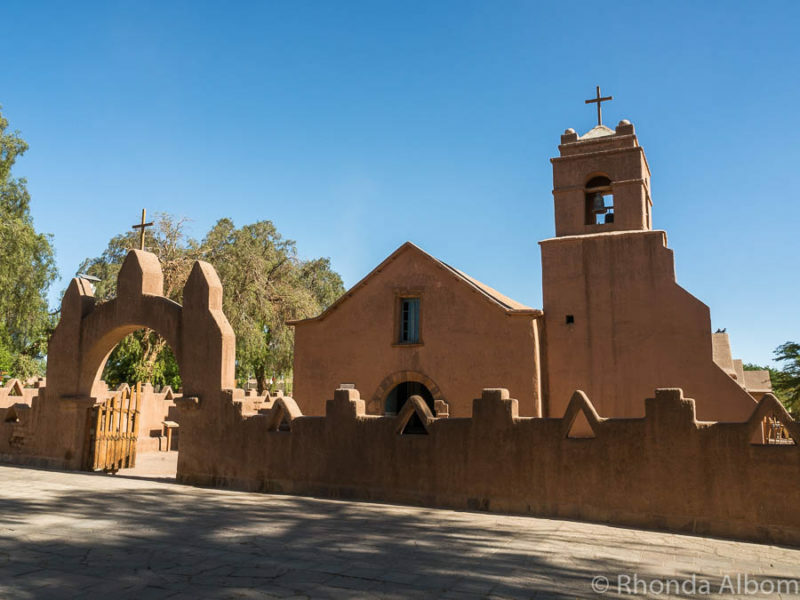 It’s an easy one hour drive to San Pedro de Atacama, the main base town for exploring the region. There is only one petrol (gas) station in San Pedro de Atacama, and while many blogs we read said it was hard to find, we felt it was well sign-posted, albeit out of the way. After exploring the Atacama desert, we flew to La Serena and headed north to Isla Damas to see penguins, an opposite sort of experience to the desert that quickly highlighted for us the diversity of Chile. 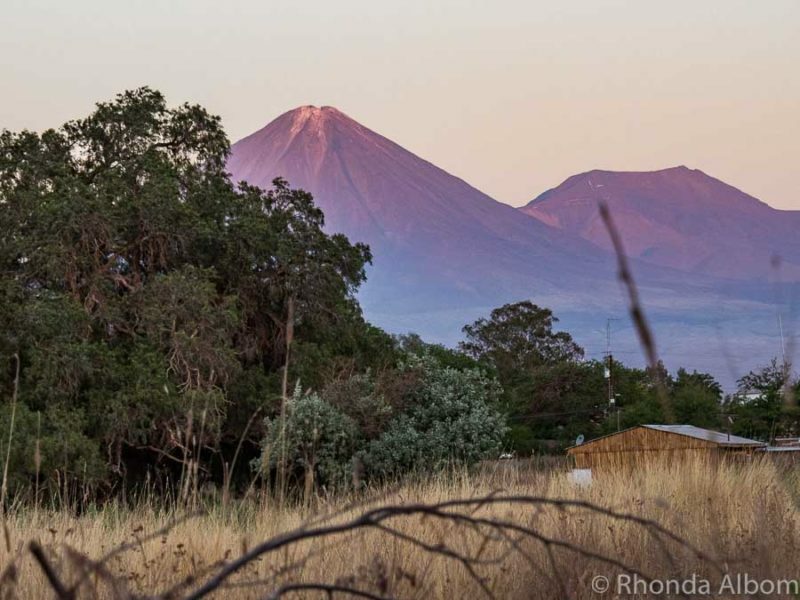 Licancabur Volcano and Lascar Volcano (which last erupted in 2015) can be seen from San Pedro de Atacama. The options range from five-star luxury to just a bed in a backpackers dormitory. We opted for a mid-range accommodation and stayed at Hard Road Atacama in a 100-year-old converted adobe house. The rooms were clean but small and the bathroom, which was added much later, was tiny. However, the pool was welcoming, the breakfast delicious, and the staff super friendly and helpful. While the price seemed high, it appears to be normal for the region. 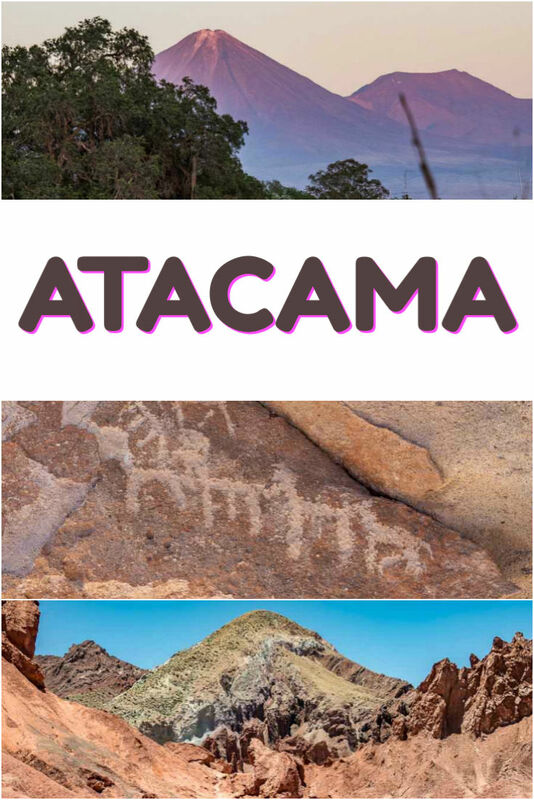 If you enjoyed this list of the things to do in San Pedro de Atacama, then please share it on social media including Pinterest. 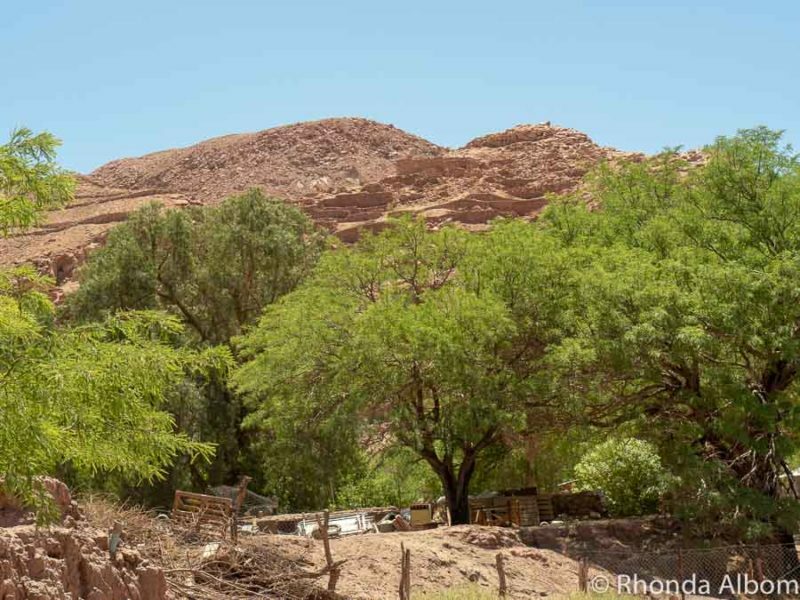 Which of the things to do in San Pedro de Atacama will make it onto your bucket list? Disclaimer: We are frequently provided with complimentary entrances, tour, or sample items to aid in the writing of Albom Adventures. However, the opinions expressed here are strictly our own. Your long trip to South America makes me very jealous, Rhonda. I always wanted to see the Atacama desert. I’m glad to see it in your wonderful pictures. Mars Valley looks indeed like from out of space. Your post gives me a lot of practical details about to see here, so I’ll bookmark it for future reference. This trip looks wonderful! Such beautiful photos. My daughter-in-law is Chilean. We have visited her in Chile, but never went farther north from Santiago than Valle de Elqui. I would also love to see the penguins at Isla Damas. Loved this post! We were staying in La Serena (very near Elqui Valley) when we did Isla Damas as a day trip. It wasn’t too far – less than a 2-hour drive. I enjoyed the tour Rhonda fab captures and scenes I have seen so many places and that’s due to all your posts heheh! Love the Moon Valley photo! Reminds me a little bit of Namibia. Always love visiting a desert, so unlike anywhere else. 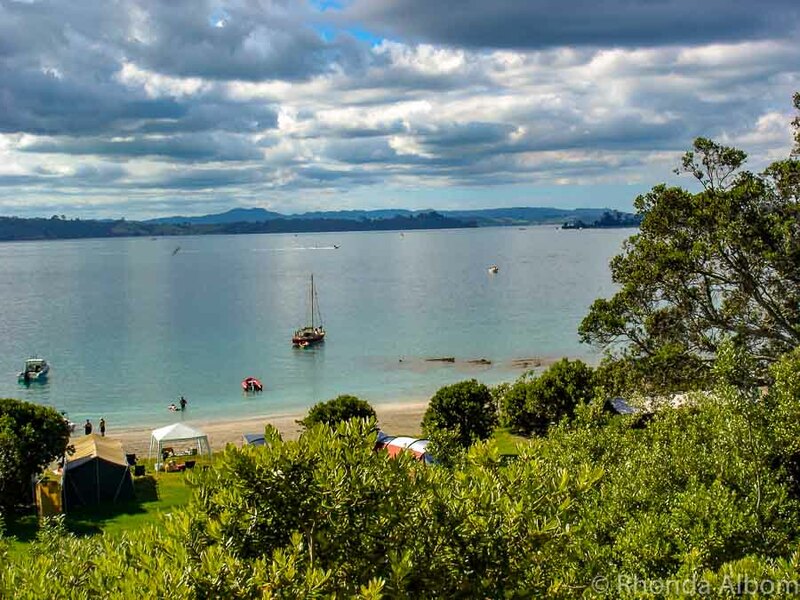 So much to do and so much to see – great post! Your South America posts are showing me that there is so much I don’t know about it. I really knew nothing about the Atacama desert but wow! I’d love to go now. And what a cool photo of the flamingos flying. You just don’t see that everyday where I live. Wow! There is so much to do. Seems like it could be hard to squeeze it all in. I know I’d especially like seeing the flamingos, the geyser field, and the ruins. Thanks for putting such a detailed list together. The geysers are quite popular, but not on our personal list. The ruins and flamingoes though, glad we saw them both. 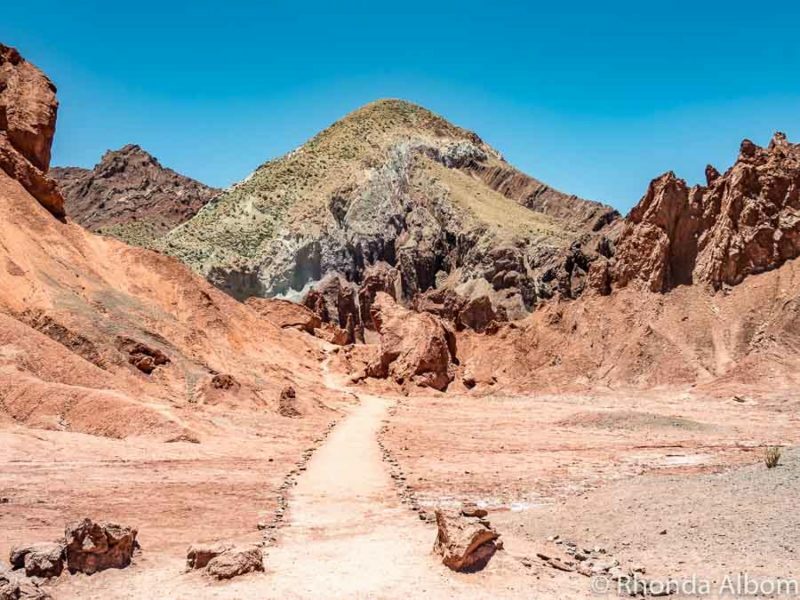 Deserts appeal to me, and there’s certainly a lot to see in San Pedro de Atacama. 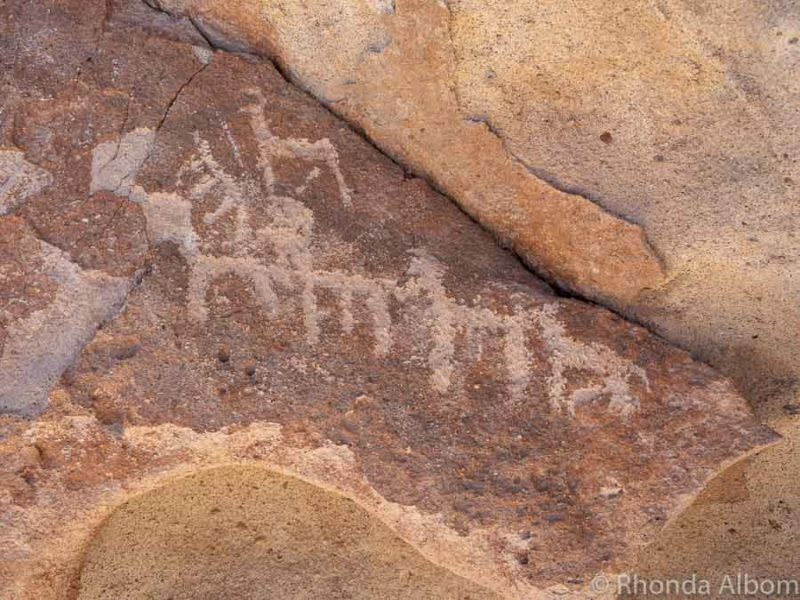 I’ve found petroglyphs in the Anza Borrego desert in California, which are especially fascinating I think. I love the history of a barren landscape. There’s so much life in a desert if you look closely. I used to live in California, but I don’t know the Anza Borrego desert. Too bad, as I really enjoy finding that looking at petroglyphs. I’ve never heard of those chanar seeds, what sort of flavour do they add? They are a bit like a caramel, but it’s a natural sweetness. This seems like such an interesting place to visit, can’t wait to actually go. Thank you for sharing! The vastness makes it so interesting, yet it was so difficult to capture in photos. Never been thinking to visit a desert until I see this article. I appreciate the desert scenery through your photographs. And they are cool! I am glad I have inspired you to go somewhere new. The Atacama desert is the driest desert in the world outside of the polar regions. I don’t think I’d like this place. If you had a monster headache I know that my head after two brain operations and having metal in my head would probably blow up. Ouch! The land is to desolate for me. See ya Rhonda. I only had a monster headache at the super high elevation. There are few places up that high, and they are easy to skip. I’ve never seen flamingoes in the wild, only in zoos. I would love to see one flying about. The terrain here reminds me a lot of Utah, here in the States. I have seen flamingoes before, but I had never seen them fly. It was so beautiful. Love the Atacama Desert. We spent time there a while ago. We combined this with Easter Island, another incredible experience. We spent a long time watching the Flamingos flying. Your post brought back great memories. Although we spent a lot of time deciding where to go, I instantly regretted skipping Easter Island when I read your comment. I am sending this to David with a title in capitals ‘I WANT TO GO HERE’. I have tried in the past to interest him in the Atacama Desert but despite more than one trip to Chile I have never succeeded. Perhaps your stunning photos will win out where I have failed. 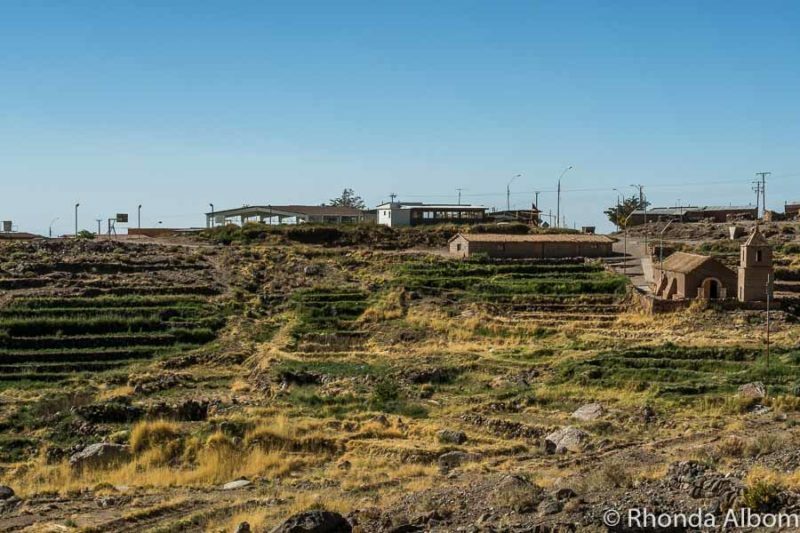 It’s an easy flight from Santiago to Calama, then an hour drive to San Pedro de Atacama. If you are renting a car, use rentalcars.com, and steer clear of going through Europcar directly. More on this coming soon, but they really burned us. Oh, so beautiful! I’m so into the petroglyphs and flamingos—I’ve never heard of these animals being into desert climates! 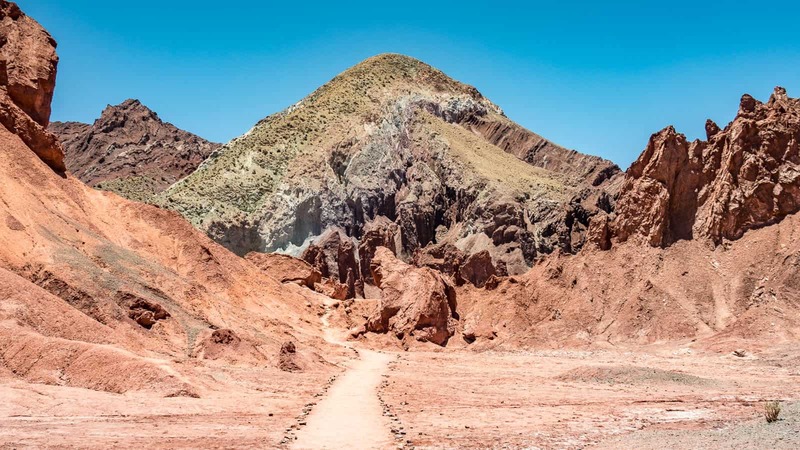 I’m not sure I’ll be able to visit San Pedro de Atacama in my lifetime, thanks to asthma not working well in desert climates, but it’s definitely beautiful and seems to contain many things I’d be interested in in one place! I was also surprised to learn that flamingos live up in the high desert. 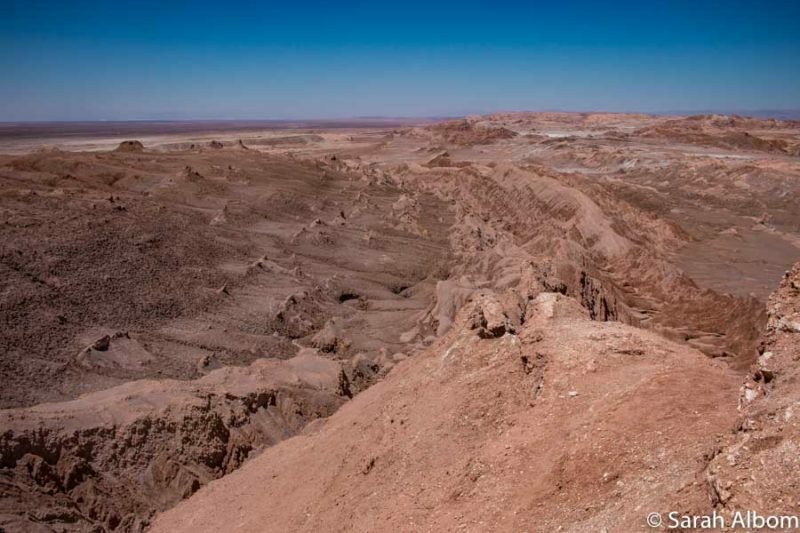 And as for desert breathing, be aware that Atacama is the driest non-polar desert in the world. I love the church and the market. All of it reminds me of New Mexico. Yes, I was having Deja Vu from Santa Fe New Mexico whenever we were in town. 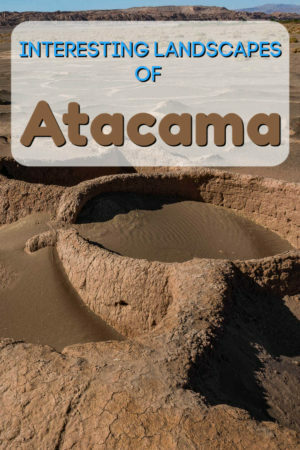 I’ve never heard of Atacama, it is so beautiful. If I ever get a chance to go down there I would have to do at least half of those in one trip. Very beautiful pictures. We stayed a week and did them all (except the geysers). Atacama is probably best known either for being the driest desert in the world or for having the clearest skies. I hate to sound negative, but there are better markets in other parts of Chile, and better things to see in the Atacama region. Which part of Chile are you heading too? We just spend nine weeks, mostly in Chile and Argentina. Hubby and I would love to visit this desert. We love all things desert and have spent many hours exploring areas around us. So much life. So much history. You’re photographs are amazing as always. Quite the variety of elements. Moon Valley is cool. 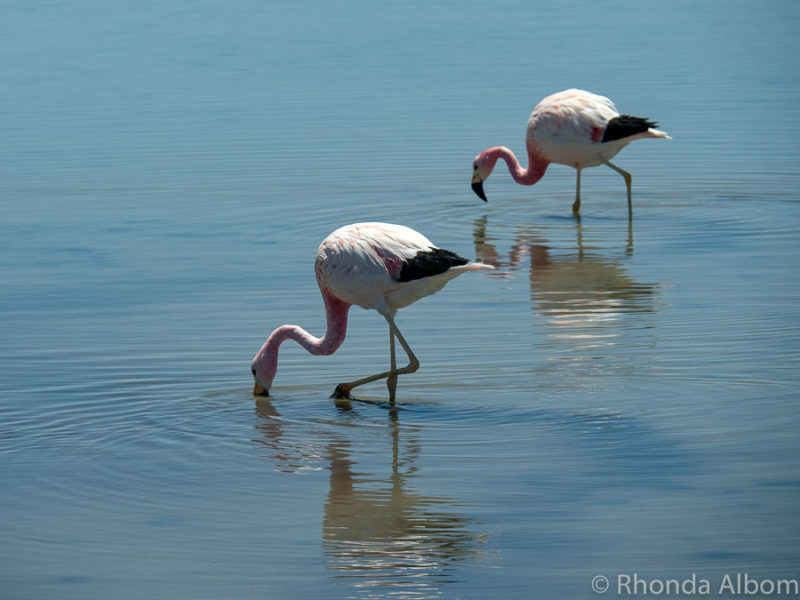 Where do the flamingos go in the afternoon? Excellent question Alex, and I have no idea. I tried to look it up but found nothing. It was the park ranger who told us this, and then we saw them start to fly – but they generally didn’t go far. I loved finding petroglyphs. I have seen them in Arizona, and a few other spots around the world, but I think the ones in Atacama are the best I have seen. That oasis looks like something else Rhonda. We saw one in the arid desert of Oman last month. Seeing an engineering feat baffles me. Keeping sweet water flowing in a desolate area? Way cool. I’d love seeing those flamingos take flight too. The oasis did remind me a bit a bit of Nizwa, and a palm desert we stay at in the Sahara. As for the flamingos, I had never seen one fly before that day in Laguna Chaxa. 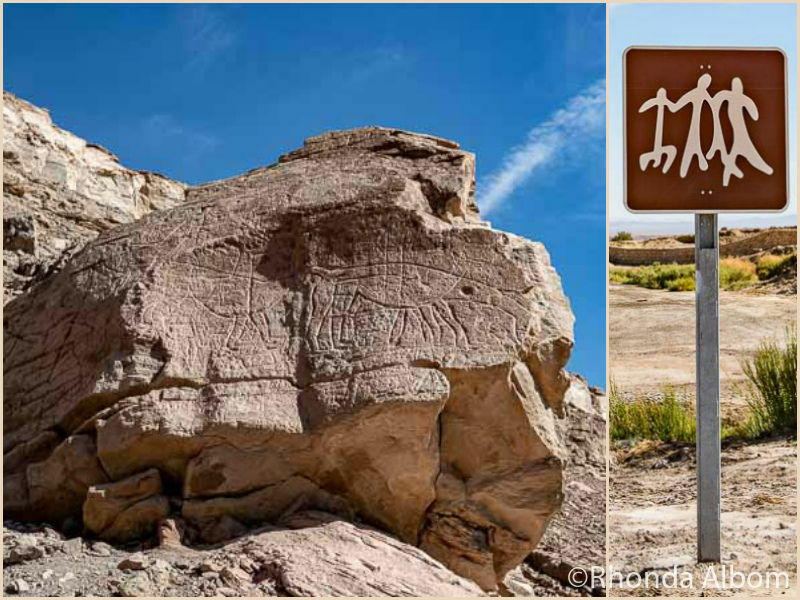 It would be so amazing to see petroglyphs in person! And I’m loving all of the beautiful views. Putting this on my bucketlist! I agree. We had a blast looking for them at some of the sites. We saw petroglyphs in three separate locations in the desert. These photos are so beautiful! They make me really want to see these sites in person! Thanks for sharing! Believe it or not, the sites are even more spectacular in person.